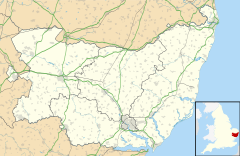 Nedging Tye is a hamlet on the B1078 road, in the civil parish of Nedging-with-Naughton, in the Babergh district, in the county of Suffolk, England. The nearest town is Hadleigh. There is also the village of Naughton nearby. Philip's Street Atlas Suffolk, 2007 edition. p. 80. This page was last edited on 6 January 2018, at 18:57 (UTC).